Dies R Us: Be Mine! Happy Dies R Us Thursday everyone! It's time to start thinking about a new year of holidays coming our way...yes the next major card giving day is just around the corner! February 14th, Valentine's Day, in case you forgot! My Valentine card starts with an A2 card base in an off white, Bazzill Walnut Cream. 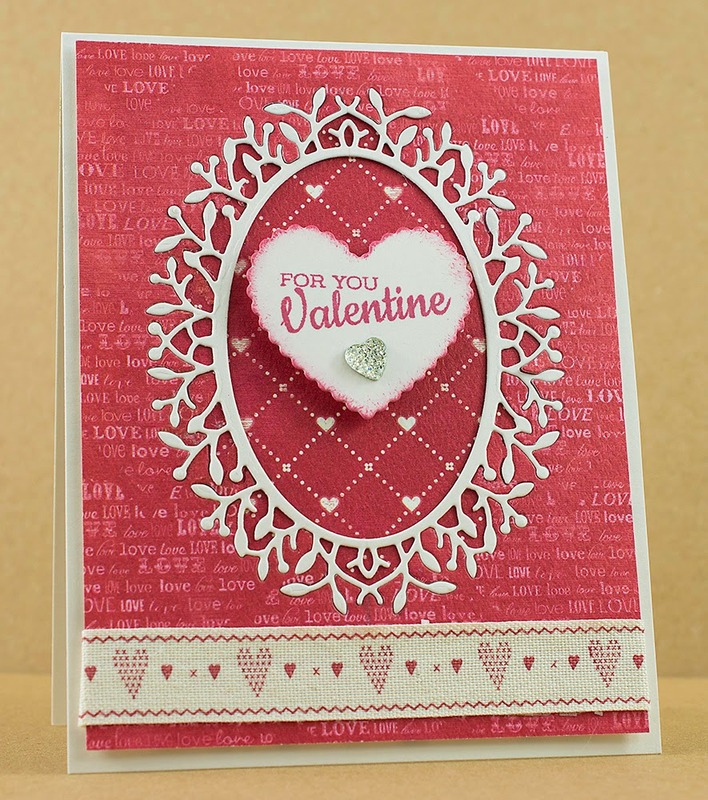 I used the same paper to cut Poppystamps Woodland Oval die and MFT Die-namics Hearts a Plenty (scalloped). From a designer Valentine paper (4 x 51/4) I cut a negative space with the Woodland Oval die and adhered another heart paper on the back. I then glued the Woodland Oval into the negative space. After adding my heart ribbon to the bottom I used foam tape to add to my card base. I stamped my sentiment (Avery Elle) onto the heart, lightly sponged the edges, added a glitter heart and attached the heart with foam pop ups. Be sure to stop by the Dies R Us store, they have many of the new releases in stock, just waiting for YOU! Shipping is FREE on orders $35 or more!